This week's highlights include the Apple TV arrival of HQ Trivia, the introduction of RapidWeaver 8, singing lessons in Yousician, and discounts on Aspyr iOS games. The popular live quiz game HQ Trivia is becoming more like a game show, with the expansion to the TV. Players can now install HQ on their Apple TV and Apple TV 4K, and play along from the comfort of the couch on the big-screen TV along with all of the other players vying for a cash prize. Rather than use the vertical layout, the tvOS version will show the host on one side of the screen, with the question on the right. Players can also select their answer using the Apple TV remote, with the larger display potentially making the game more useful for players in groups. Apple TV owners can download HQ Trivia from the tvOS App Store. It can also be summoned by a Siri query to find HQ Trivia. Get it for iOS: Free. Requires iOS 10.0 or later. Realmac Software's web design tool has been given a refresh for version 8, with a new user interface that is cleaner and easier to use. The interface also adds features like State Restoration, which can open projects in the same state as the user left them, allowing for work to recommence quicker. A new Resources Manager grants access to the user's photo library and, if the right image isn't available, the ability to search the Unsplash stock photo service. The add-ons manager can enable and disable plugins, themes, and stacks on an individual level, and five new themes using the responsive Bootstrap 4 will give more options for where to start building a site from. There is also a new device simulator function, that shows what a site will look like on other devices. Multiple windows can be opened at a time, with the different views updating automatically and simultaneously to take into account any changes made by the designer. Get it for macOS: $79 at launch rising to $89 at a later time. Upgrades are available for $59 at launch, $69 post launch window. Requires Mac OS X 10.11 or later. Paragon Software has released two new drivers optimized for the incoming macOS Mojave. The first, NTFS for Mac, allows users to connect a Microsoft NTFS-formatted drive to a Mac and to write, edit, copy, move, or delete files. The tool can be set to run in Read-Only for accessing data without modifying files, while drives can also be set to not mount automatically when connected. The other tool, APFS for Windows, lets Apple File System volumes be accessible on PCs. The updated tool includes support for encrypted volumes and APFS Containers with multiple partitions, as well as Fusion Drives. Get NTFS for Mac: Free. Get APFS for Windows: Free. The tuition service designed to teach you how to play music has added a new instrument alongside the piano, guitar, bass, and ukulele: their voice. In the latest update, Yousician is now teaching people how to sing, with lessons on how to use the correct key, how to stay relaxed, and how to explore their own voice. A total of 126 voice-focused lessons have been added, as well as hundreds of songs to test the learner's vocal chords. More games and features, as well as lessons, songs, and exercises, are said to be on the way. Version 2.54 also introduces the ability for a user to reset their progress on an instrument, if they want to start again from scratch. Get it for iOS: Free, with subscription after initial trial period. Requires iOS 9.0 or later. Note-taking app Evernote has been given a makeover, with the modernization arriving shortly after the company celebrated its tenth anniversary. As part of the changes, the app now has a new design style and color palette, bringing it up to date with its rivals. Part of the brand changes involved exchanging some of the fonts, with the logo's Caecilia typeface replaced by Publico, while Soleil will be used as a secondary font for other areas. Lastly, the elephant logo known as "Mads" has been given some refinements, including increasing the size of the "page fold" ear, and coloring it green instead of grey. Other than tweaks to the appearance, the app provides the same functionality and services as usual. Aspyr is marking Apple's visit to their offices for an interview about its port of Civilization VI to iPad, by offering discounts on its titles. A number of iOS games from the company are being offered at up to 60 percent off their normal price, until August24. Top of the list is Civilization VI, a port of the macOS version remade for the smaller touchscreen. Notable other additions include Star Wars: Knights of the Old Republic, and Jade Empire: Special Edition. What a hot mess of crap. This 60% discount is nowhere to be found, as far as I can tell. Their blog mentions it but I can't find it in iTunes. Looking at 'more from this developer' shows maybe four games. If there's a discount, they don't want you to find it, and it may take until the 25th to do so. I'm less interested now then when I first read the article. If anybody can shed some light on this, I'd appreciate it. Maybe it's just too early in the day for me. iTunes is still a hot mess of crap regardless. You won't see it on the Mac desktop. You'd have to open the links on an iOS device. You'd have to open the links on an iOS device. I did. That's how I knew there were only four games on the 'list'. 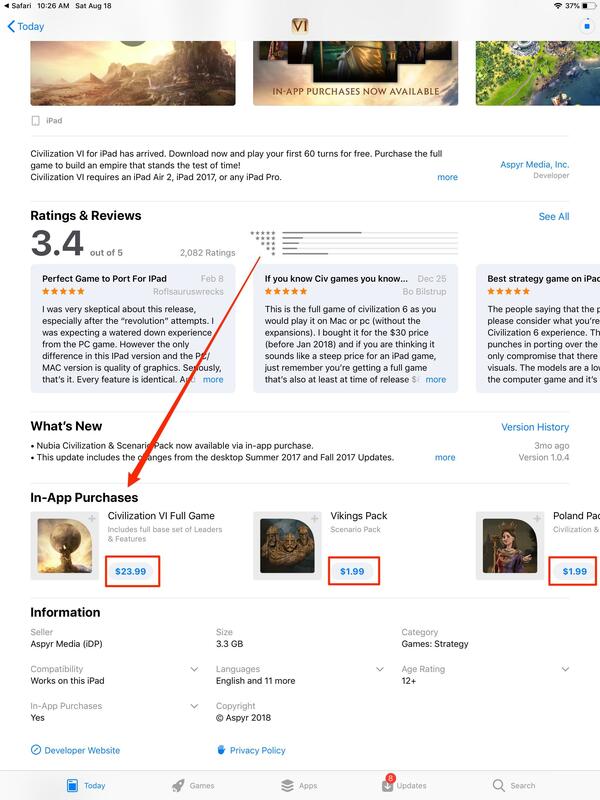 Most devs post the sale notice on their app pages along with an expiration date. This doesn't seem to be the case with Aspyr. So while the up to 60% discount is accurate strictly speaking, I think Aspyr is being disingenuous in their ad copy.